Spinsters and Lunatics: "terrifyingly intense..."
Riley Patterson has been an obsessed and solitary man since his wife was murdered three years before. Hannah Cooper was an Alabama fishing guide enjoying a vacation in the Wyoming wilderness when she was attacked -- probably by the same man who killed Riley's wife. Thrown together, this pair bonds as Hannah struggles to remember clues that will bring her attacker -- and the murderer of at least a half-dozen other women -- to justice. Maybe she can also free Riley of his overwhelming guilt. A battered, nearly broken man, a feisty, self-reliant woman and a sickly evil marauder are only three of the great elements of this terrifyingly intense tale. Want to get a copy early? It'll be available December 1st online at eHarlequin.com. On December 1st, click on the Harlequin Intrigue link, then select "January 2010." Buy several--you can give them as Christmas gifts! 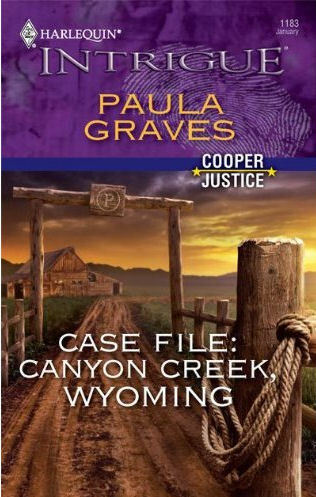 This sounds like a terrific book, Paula. Can't wait to read it. BTW, I'm really enjoying "Code Name: Willow." Am on pins and needles to read chapter 16! Thanks, y'all! CASE FILE: CANYON CREEK, WYOMING is one of my favorite books I've written so far. I hope y'all like it, too. Chapter 16 debuts tomorrow, Kea!